TEL AVIV, Israel (AP) — Thousands of Israelis took to the streets early Sunday to celebrate their country's victory in the Eurovision Song Contest. Fans flooded Tel Aviv's Rabin Square in front of City Hall, with some euphorically jumping into a public fountain, after Netta Barzilai was announced the winner in Portugal with her techno dance tune "Toy." The City Hall building was lit up to spell "Toy" and electronic signs throughout the city congratulated her. Netta Barzilai has won the 2018 Eurovision Song Contest for Israel with her song "Toy." Barzilai, who was the favorite to win ahead of Saturday's Grand Final, saw off competition from 42 other countries' performers to claim the music extravaganza's annual crown at a show in Lisbon, Portugal. LISBON, Portugal (AP) — The Eurovision Song Contest has completed its lineup of 26 contestants who will face off for this year's crown, following a second semifinal. Missing out on Saturday's headline show were Russia, Georgia, Latvia, Malta, Montenegro, Poland, Romania and San Marino. LISBON, Portugal (AP) — The first semifinal of the Eurovision Song Contest has sent 10 countries' performers to the Grand Final — and ended the dream of nine others. 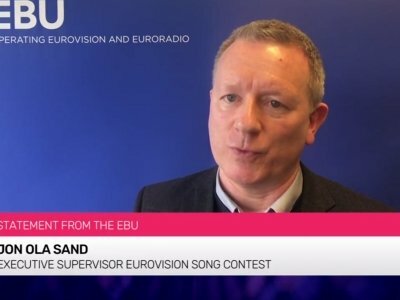 Contestants from Austria, Estonia, Cyprus, Lithuania, Israel, Czech Republic, Bulgaria, Albania, Finland and Ireland were chosen Tuesday night to advance in the competition after votes by a professional jury and the general public. LONDON (AP) — Sprinkle the sequins, spark up the disco lights and get ready for battle — it's time for the Eurovision Song Contest , a celebration of kitsch and cheesy pop with an undercurrent of politics and patriotism. More than a singing contest, it's diplomacy in dancing shoes. MOSCOW (AP) — Russia says the singer who has been refused entry into Ukraine for this year's Eurovision Song contest will be the country's entry for 2018. Yuliya Samoylova, whom Russia chose to sing in May's competition in Kiev, was blocked by Ukraine because she had toured in Crimea following Russia's 2014 annexation of the region. Ukraine said she violated the law by not entering via the peninsula's border with the mainland. MOSCOW (AP) — Russia's Channel One says it will not broadcast the Eurovision Song Contest in Russia after Ukraine, which hosts the contest this year, has barred the Russian entrant from traveling to the country. Ukraine's security services banned singer Yulia Samoylova from entering Ukraine because she had toured in Crimea after Russia's 2014 annexation of that peninsula from Ukraine. GENEVA (AP) — Eurovision song contest organizers say they have taken the unprecedented step of offering to let Russia's contestant perform via satellite after authorities in host Ukraine banned her from entering the country — a proposal that was immediately rejected by a Russian state broadcaster. MOSCOW (AP) — The Eurovision song contest, nominally an apolitical festival of pop music confections and cheerfully tacky costumes, erupted into a political dispute Wednesday after Ukraine banned Russia's contestant from entering the country. Yulia Samoylova, who was to represent Russia in the May 11-13 contest in the Ukrainian capital Kiev, was banned by Ukraine's security service because she had toured in Crimea after Russia's 2014 annexation of the peninsula from Ukraine. MOSCOW (AP) — Russia has announced its entry in the upcoming Eurovision song contest, seemingly putting an end to speculation that Russia might boycott the politically charged competition in Kiev. Several Russian lawmakers and entertainment stars have called to boycott the competition to be held in the Ukrainian capital in May as once friendly relations between the two-countries turned into open animosity following Russia's annexation of Crimea and support for separatist rebels. GENEVA (AP) — Organizers of the Eurovision song contest say Portugal and Romania will return as the glitzy, popular show heads to Ukraine's capital of Kiev next year. The European Broadcasting Union said Monday the May 11-15, 2017 event will have 43 countries taking part, matching the record high. Portugal's broadcaster skipped out this year partly for programming changes, while Romania was kept out because of outstanding debts that its broadcaster owed to EBU. MOSCOW (AP) — Ukraine has announced that next year's Eurovision Song Contest will take place in its capital, Kiev. Ukraine is the host after Ukrainian singer Jamala won this year's event in a moment of national pride for this former Soviet republic.